New Data Entry Website for Sizing Abalone! The Nature Conservancy (TNC) is working with a group of northern California Recreational abalone fishermen to demonstrate a collaborative approach to data collection, data assessment and fishery management. As part of that collaboration TNC is developing an online data collection “tool” that uses photo-recognition technology to measure abalone sizes. 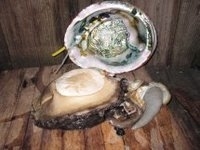 We would like the help of interested abalone divers to develop the tool. The tool is simple and easy to use and involves taking two pictures, measuring the size of each abalone that you take and then uploading it the following site: https://tncfish.typeform.com/to/CzaLS3. The data can be uploaded with either a cell phone or computer. This is not a contest or competition. Scroll down to learn more about abalone locations, abalone pearls, and other interesting data relating to the red abalone. input and dedication to the best sport in the world this site would not exist..
click on below link to learn about the "Red Tide"
Click on above link to see what diver spouses have to say about abalone divers.. Question: How fast do abalone grow? Answer: Abalone are relatively slow growing. Tagging studies indicate northern California red abalone take about 12 years to reach seven inches, but growth rates are highly variable. Abalone grow nearly one inch per year for the first few years, and much slower after that. It takes about five years for red abalone to grow from seven inches to eight inches. 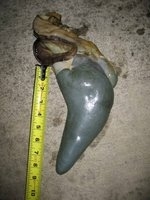 At eight inches, growth rates are so slow it takes about 13 years to grow another inch. Slow growth makes abalone populations vulnerable to overfishing since many years are needed to replace each abalone taken. *more info*Gary Pilecki and Jerry Pancake researched the above picture ...The restaurant was called the Abalone Restaurant and was located at 7275 Beverly Blvd, Hollywood, CA. note: scroll down to view the many links relating to diving, spearfishing, scallop diving, cleaning shells, recipes, shark attacks, abalone laws, etc. More abalone information: Chemical studies conducted by Albrecht(1917)indicated the muscle tissue of abalone contains 70 percent water and 30 percent solids. Further analysis revealed that abalones contain 23 percent proteins and 3.42 ash.Mammalian muscle averages about 1.0 percent and fish about 1.5 percent..Fish Bulletin No. 118 CDFG. Sea Otters, Fishes, Crabs, Octopuses, Starfish, Parasitic Snails, Parasitic Worms, Boring Clams, Boring Sponges, Pearls, Sea urchins, Commensal Shrimp, and Storm Losses are explained in Keith Cox’s Fish Bulletin No. 118 CDFG. PEARLS... Occasionally a small foreign body may become lodged between the abalone's shell and mantle.When this happens, the abalone deposits nacre around the foreign substance, producing a "free" pearl. These are irregular in shape and of value only as novelties. Free pearls have also been recovered from the gonads and digestive tracts of abalones but how they have arrived in these locations is unknown...(info taken from Keith Cox's 1962 Fish Bulletin. Pearls: (left to right) Bob Schultz's beauty, Mike Filosi's monster, Mike Bettencourt's 2 1/4" hulk, Eric Anderson's 135 carat pearl and Matt Beary's beauty. These are all abalone gut (gonad) pearls. Mark Shimizu designed and created Anderson's and Schultz's.The pearl in the hand belongs to J.K. Lee an avid shell collector and diver. 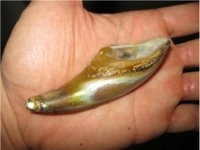 His pearl is over 3 1/2" in length and is over 200 carats. It has not been polished; a real gem. The next two pearls are Eric Anderson's...The one on the left is 3/4" round. 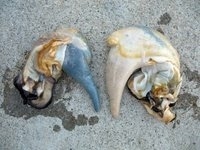 The one on the right is nearly 3 inches long.The next pearl a 3" beauty ( left) was found at Stillwater Cove by David Clutts. Following is Devin Eutsler's 5/8" round pearl, a real beauty. The pearl on the right is a 44 carat gut pearl found by Owen Mitchell...The next pearl was found and belongs to Steve Farrell. This pearl has a nice sheen..Roy Leeper (next left pic) found these two beauties in an abalone that was a non trophy size ab. The ab may not have been a trophy but the pearls are....Found 4/16/11..(next right pic) Dwayne Dinucci's 10" abalone (4/17/11) housed all of these pearls. Amazing!! Next picture..This beauty was found by Chuck Becker (Stillwater Cove) and bottom picture pearls were found by Ken Butler. Good sheen! Above are short videos showing the most common methods of shucking and cleaning abalone...The alternate shucking method removes the top skin of the abalone. This method works well, however, it takes practice to be efficient. The alternate shucking video was provided by Dwayne Dinucci. DIVING FOR ABALONE: The gathering of abalone for a food source has been going on for thousands of years. The gathering (now called rock picking) still goes on today; however, the sport of free diving (without an air supply) has created abalone diving into an extreme sport. Diving for abalone is not for everyone. One must possess healthy lungs, legs, and a strong mental ability if they are to perform well in their endeavor to hunt the giant red abalone of California. This is truly a sport of inches; legality (7 inch ab) versus trophy hinges on 3 inches and above. 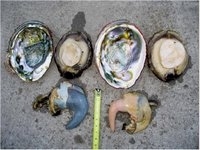 Ten inch abalone range from the shallow tidal waters to a depth of 50 feet. Bragging rights, a beautiful shell to display, a few pounds of meat, a rare abalone pearl, a demanding physical challenge, and best of all, a mental victory are the diver's reward. It's a dangerous sport if one is not prepared for the hunt, but a rewarding endeavor if one is. This is one sport where experience is a key factor. Experience in determining "when to" and "not to" pursue the hunt depends on ocean conditions. This is by far the most important of all factors. Web weather and ocean predictions are abundant and are extremely important in determining the dive. However, these predictions are not always 100% correct. A trained eye is also a must in making the correct call. A large swell, the seconds between swells, and wind causes havoc to a diver. Many inexperienced divers fail to make the correct selection of where or when to dive. Incorrect calls by the inexperienced diver may result in ocean rescues or death. Correct equipment plays a very important role in the divers ability to perform properly in the 46-56 degree waters of northern California. Yes, there are great white sharks in northern California. Know where they hang out and avoid these areas. Shark attacks are rare and should be the least of a diver's concern. California Fish and Game laws change, so one must be aware that the CF&G rule book published in February may not be valid in October. Also, The Marine Protection Areas are being implemented in 2008 so be aware, legal and safe.